HARTFORD - Newtown will be well represented later this week during the 37th Annual Connecticut Flower & Garden Show. Peg Townsend of Bethel, a member of both The Town and Country Garden Club of Newtown and The Garden Club of Newtown, will be an entrant in this year's show, which returns to the Connecticut Convention Center Thursday, February 22, through Sunday, February 28. Ms Townsend, who is also the current president of The Garden Club of Newtown (GCN), will be offering entries this year in horticulture designs. Fellow GCN members Deb Osborne and Joyce DeWolfe will also be entering that division of the show. GCN members Holly Kocet and Mary Gaudet-Wilson plan to enter an educational display, and GCN members Peg Jepsen and Vicky Taloni - along with Ms Osborne and Ms Townsend - are planning horticulture entries for one of the largest flower shows in New England. Ms Townsend said a number of residents will also be seen in Hartford next weekend. "Several members from both of these clubs will be serving as clerks and judges," she said. "Both clubs will also be sending groups, often carpooling, to visit the show itself." Ms Townsend won a blue first place ribbon and The Grower's Choice Award in the horticulture division of last year's Connecticut Flower & Garden Show for a dish garden she created using six cactus plants. She also received a blue ribbon and a third place ribbon for entries in the show's Artistic Crafts Division, a blue ribbon for an entry in one of the horticulture classes, and a third place ribbon for an entry in a floral design class. Deb Osborne also did very well last year, returning from Hartford with her first Connecticut Flower Show blue ribbon as well as the Educational Top Exhibitor Award for a display she created to educate show visitors about invasive plants. She also collected a blue ribbon, two second place ribbons, two third place ribbons, and two honorable mentions for various horticulture entries. Joyce DeWolfe was honored with a pair of second place ribbons last year, the first time she entered a Connecticut Flower Show. The Federated Garden Clubs of Connecticut's Advanced Standard Flower Show will feature more than 12,000 square feet of design and horticulture competition, and more than 400 entries from across the state, according to advance publicity. This year's competition theme is "Breath of Spring." More than 300 booths of displays, activities, and shopping: artisans and handcrafted gifts, fresh flowers, plants, garden ornaments, metalwork sculptures, herbs, bulbs, seeds, fertilizers, soils, gardening books, patio furniture, and lawn and garden tools and equipment. The show will also feature more than 80 hours of seminars by horticulturists and experts on myriad topics, all included with general show admission. Show hours are 10 am to 7 pm Thursday, February 22; 10 am to 8 pm Friday and Saturday, February 23-24; and 10 am to 5 pm Sunday, February 25. Admission is $18 adults, $16 ages 62 and over (Thursday and Friday only), $5 for ages 5-12, and free ages 4 and under. Group rates for 15 or more people can be arranged in advance by calling 860-844-8461 or sending e-mail to Kristie@northeastexpos.com. Admission is cash only. The expo center is at 100 Columbus Boulevard in Hartford. Additional show information, including the schedule and brief bios for speakers, an event floor plan, and more, is available at ctflowershow.com. It was literally a blue ribbon - and special award - year for local gardeners last year following the 36th Annual Connecticut Flower & Garden Show. 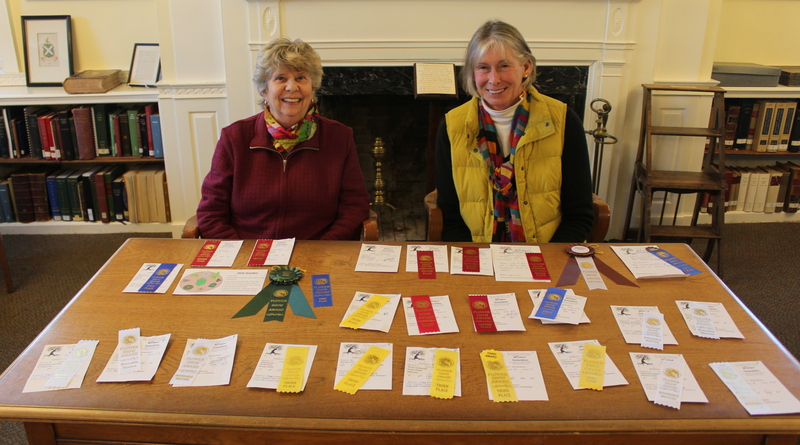 Peg Townsend, on the left, and Deb Osborne returned home with a collection of ribbons, as did other members of The Garden Club of Newtown. The two women, and five others, are hoping to have similar success next weekend, when one of New England's largest and most prestigious shows returns to Hartford.